Krayt Dragon Films is proud to announce that we will be continuing our phase one of Marvel comic dubs with the Marvel: The Champions series! 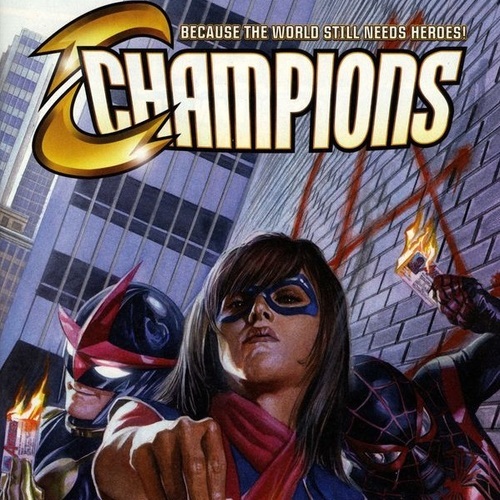 (Not to be confused with our Contest of Champions series that is currently underway.) KDF has been producing critically acclaimed comic series similar to this one for a little under three years, except we have solely focused on producing Star Wars content. We are thrilled to include this series in our line up! Before we delve too far into what this project is about, we have supplied links to some of our previously completed works to give you a feel for what you will be voicing. 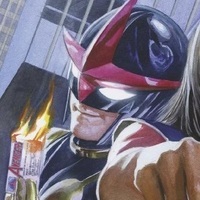 In the aftermath of the Civil War II storyline, Ms. Marvel, Spider-Man (Miles Morales), and Nova have left the Avengers and make plans to "put the world back together." After recruiting Hulk (Amadeus Cho), they head to Washington DC to recruit someone on Cho's suggestion: Viv, the synthezoid daughter of the Vision. On Viv's suggestion, the team heads to Baltimore to stop Pagaliacci from kidnapping underage girls for human trafficking. After freeing the girls and stopping Pagalicci, they form the Champions. What is in store for the Champions? What adventures will these young heroes endure? Sufficient to say this will be one action packed series for the ages! Series Director and Producer: D.J. 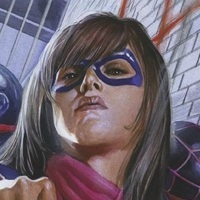 Ms.Marvel is a 16-year-old Pakistani-American female from Jersey City, New Jersey. She is nerdy and a huge fan of the Avengers, in particular, Captain Marvel. Kamala has trouble with her everyday, ordinary teenage life. She has a desire for something more, a more heroic life. Kamala loves to help people and reluctant to use genuine violence, even against animals. However, her people skills are disorganized, being both shy and spontaneous. Described as an introvert, she can take center stage, with the spontaneous nature spanning from the determination to do the right thing. She has a strong love for her family, but holds a little resentment about her culture and religion, as she feels it’s always making her different. While she is courageous, smart, with a strong moral core, she deals with a sense of isolation caused by being a Muslim in America. As she has trouble fitting in, one of her most preferred activities are all online, mostly as a gamer and fanfic writer. Kamala is young, petite and on the mousy side. Someone with a slightly higher, younger, and feminine voice is needed. Along with someone who can portray her nationality. (We are only looking for a slight accent.) As this is a lead role, we are looking for someone who is fun and strong, but can still bring this shy, young girl to life. 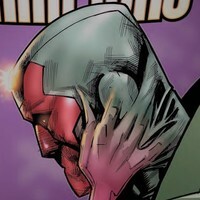 - Vision: "Their anger is understandable. After what the world has been through, we may have to earn the public's trust anew." - Ms. Marvel: "We could start by fixing the train tracks. Who's up for that? - Falcon: "If we could..."
- Falcon: "Stark's not here. None of us are engineers. Where would we get building supplies? And there are unions for this kind of-"
- Ms. Marvel: "That's what you always say!" - Falcon: "I didn't know it was an issue with you." - Ms. Marvel: Of course it is! Look at this damage! People's livelihoods! That food truck's not gonna repair itself! Why am I the only one who wants to help?" - Falcon: "That's not fair, kid." - Ms. Marvel: "No. No, it's not. I can't do this anymore. I quit." - Ms. Marvel: "I get it, okay? I just... you were right. They don't seem to care. All the "grown-up" heroes broke the world with this dumb war... and they don't seem interested in putting it back together! But somebody should!" Miles is a 14-year-old- African- American male from Brooklyn, New York. His features are a combination of his mixed heritage, being both Hispanic and Black. He is tall and slender and has mostly passed the awkward teenage growth stages. Miles is what you would think of when you think typical geeky 14-year-old boy. He is slightly more introvert, having a few close friends. 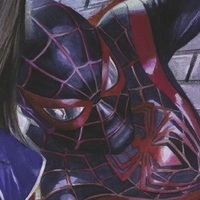 While he is also extremely close to his mother and father, he has kept his secret identity, as Spider-Man, a secret. Miles has a very strong sense of responsibility, forced to fill much bigger shoes. Miles is reasonably intelligent but is extremely noble and self-sacrificing. With his sense of responsibility comes a very large sense of guilt. Both that have shaped his life, even leading him to his fateful spider bite. One of his worst guilts being that he wasn’t present to help Peter on the Brooklyn Bridge, possibly saving his life. This guilt has transferred into a drive to live up to Peter’s memory. Miles is also very brave, it comes instinctively to him. This doesn’t make him fearless, he is still nervous and scared in combat. Most of these apprehensions come from what people are going to think of him, mainly being a poor imitation of Peter. He does his best to mimic Peter’s movements and mannerisms, even using the same mockery Peter used in combat. Miles seems like a very typical teenage boy at first glance. However, his jealously guards his true identity. Going great lengths to avoid anyone discovering it. Miles is a very young and slender, who is dorky and shy. His use of mockery in combat may make him seem sarcastic. Someone with a younger, higher pitched voice, African-American voice is needed. This is a lead role, and needs someone who can portray this geeky, sarcastic, shy but powerful young male. - Miles: "Keep your space-pants on. It's not like there's any good way to web-sling up here. Also, I changed my mind five times on the way because I can guess what this is about." - Nova: "She's about to say "somebody should"." - Ms. Marvel: "Somebody should!" - Miles: "Oh God. I of all people have suffered enough from the fallout of this mess. I'm-"
- Ms. Marvel: "We can make people believe in what we stand for again! I bet a lot of heroes our age want that!" - Miles: "If you'll let me BREATHE, I think I know a guy." - Miles: "Marvel, get hold of the miners! Nova's gonna grab you on three and do his human... rocket... thing..."
Samuel Alexander, Sam for short, is a 15-year-old male from the very small town of Carefree, Arizona. He lives with his parents, his father who is Jesse Alexander, and his younger sister. Sam’s father, Jesse, always told him and his sister stories of his adventures in space and stories about the Nova Corps. However, Jesse was known as a drunk and very delusional, Sam never believed his stories. These suspicions are put to rest when his father goes missing, and Sam goes searching for him. While searching, Sam gets into an accident which leads him to wake up in the hospital, where he is greeted by Gamora and Rocket Raccoon. They inform Sam of his father's true legacy as a member of the Nova Corps, leaving Sam his helmet. Sam is still very young, making him act immaturely in some situations. He is laid back, but full of himself. However, he is actually very insecure and inexperienced. Sam also can be very arrogant due to his powerful abilities. He does have a deep love for his friends and family. He thinks of his father as a loser but still cares for him deeply. Sam can also speak some Spanish due to his mother using the language frequently. Sam is self-confident, a little too overconfident for a matter of fact. He is young and ends up being arrogant, full of himself, and childlike most times. Someone with a slightly higher pitched, male, American teenager voice is needed. This is a lead role perfect for someone who can portray this witty, bold, powerful but childlike young male. - Nova: "Go ahead. Tell us why we were childish for what we did. Give us your dumb sales pitch. Then we can leave and get on with our lives." - Nova: "He has a refrigerator? This isn't what I would have expected in the Vision's house." - Nova: "Congrats! You're my first human trafficker. You make me nauseous you sick creep." 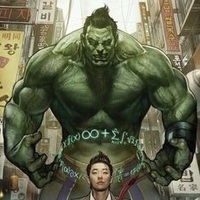 Amadeus Cho is a 19-year-old Korean American male who was born and raised in Tucson, Arizona. The words "above average" are very insufficient when come to defining this extraordinary teen. His parents, Philip and Helen Cho, noticed from a very young age that there was something very different about their boy. He was incredibly smart for a young boy, teaching himself, becoming highly cultured and increasing his already remarkable intelligence. The more Amadeus grew, the more his parents realized he was a genius. At a very young age, it was discovered that he had the ability to calculate and perceive the endless possibilities of a moment. He has a superhuman brain called a hyper mind, making him one of the smartest people on the planet. At the young age of 15, Amadeus enters an online game show that rewarded young geniuses. The quiz show is known as Brain fight, which was hosted by Excello, a soap corporation. He easily won, placing first and wining $5,000. However, what he didn’t realize that the Brain Fight was in fact organized by another genius and dormer child Prodigy, Pythagoras Dupree, whose real goal was to search the world for other people whose mind might rival his own, and later, eliminate his unwanted rivals. Dupree set to explode Amadeus house, which failed to kill him but killed his parents. This made Amadeus very paranoid and angry and put him on the run. Despite this, he is still very young at heart. Even though he’s 19 and the sixth smartest person in the world, he is fun, childlike, loving and hyperactive young man. Amadeus' brain is his strongest weapon. However, his brain also needs sugar to operate at that high of a level, which requires him to eat a ton of candy and junk food to fuel his intelligence. Amadeus is a very intelligent, fun and loving young man. He has complete control over his Hulk form, making his Hulk very intelligent and punctual, but still extremely strong. Someone with a younger sounding, male American voice is needed. This lead role needs not only someone who can voice the intelligent, childlike Amadeus. But also the much larger and stronger Hulk form. - Maddy: "God, you're the world's dumbest genius. You don't do surgery with a sledgehammer, dummy! You stub your toe, the whole shaft could collapse!" - Hulk Cho: "Relax! I'm almost to 'em! Headlight's giving me thermal signatures just beyond this last pile of rubble! I just have to figure out how to Jenga it away without..."
- Cho: "Hang on. I don't want to wreck the furniture. Look. If we're gonna start throwing our weight around, we need someone who's plugged into worldwide events around the clock." - Cho: "People, this is Viv. She's my online partner on Battlesmite, and she's like me... totally awesome! When was the last time you played Viv? - Viv: "I am playing now." - Cho: "See? All the Visions have built-in super-speed WI-FI and multiprocessors! She can be our own personal troubalert!" Vivian Vision, Viv for short, was a synthezoid created by the Vision in his process to humanize himself through the creation of a family. Her along with her brother, Vin, brain waves come from the combination of the brain patterns of the Vision and Virginia, Viv’s mother and Vision’s wife. As a family, the Visions moved to Arlington, Virginia. Both Viv and Vin attend school at the Alexander Hamilton High School in Fairfax. After the tragic event leading to Vin’s death, and Virginia's subsequent suicide, Viv, and Vision tried to carry on with their family life in Cherrydale. Not long afterward, Viv joined the Champions, alongside Ms. Marvel, Spider-Man, the Hulk, and Nova. Viv is very inquisitive and explorative. Viv is always pushing the limits of her mind and body. This sometimes causes awkward situations, as her idea of normal is often different from others around her. She is usually calm and passive, but when provoked, she can let loose a great amount of emotion and anguish. She also tends to misunderstand sayings and many situations and can take offense quite easily. Although Viv is a Synthezoid, she was made as a young woman. She has a calm and cold demeanor and tends to be quite straightforward. This is a lead role looking for someone who is an average young American woman. However, we need someone who can portray her character with a slightly robotic voice, BUT NOT MONOTONE! Feel free to enhance your performance with any type of filter you need, just please don't use one that is too heavy or to where we can't understand your audition. - Hulk Cho: "Viv, stay intangible!" - Viv: "There is no need. I share my father's abilities... including the ability to release solar energy." - Viv: "Please try not to panic. Hulk will help you, but he cannot attain proper leverage to lift the container." - Hulk Cho: "How are they?" - Viv: "Free and safe. We will notify the authorities for your care and... oh no. No." - Hostage: "She's been like that for hours! Help her!" - Viv: "I'm afraid I cannot. I am sorry. She is beyond saving." Vision is an android who possesses a synthetic vibranium body created by the villain Ultron and Helen Cho, along with the powerful gem known as the Mind Stone. The body was stolen by the Avengers, after which it was repurposed by Tony Stark and Bruce Banner, who used it to upload the remnants of the A.I., J.A.R.V.I.S. He is a mixture of both Ultron and J.A.R.V.I.S., who would fight to protect humanity at all costs. Vision’s personality is similar to Ultron’s, only without the megalomaniacal aspects. He is polite, calm, and a thoughtful being. Unlike Ultron, he values all forms of life and is also known to be blunt. Even though Vision is an android, he best fits the likeness of a middle-aged man. With a calm, polite, thoughtful but blunt. We are looking for someone who can portray the Paul Bettany version of Vision from the MCU. - Vision: "May I help you?" - Hulk Cho: "Hi. We're here to see your daughter, Viv?" - Vision: "I believe she is in the basement. I will advise her of your presence." - Miles: "You're not mad at us for quitting the Aven-"
- Vision: "I bear no grudge. No one else is home, and I am leaving soon. Partake of refreshments from the refrigeration unit." Pagliacci is a very sick and demented opera clown that leads the Commedia Dell’Morte, this group claims to be Europe's greatest assassins. He is a post-human thrillkiller with a body count in the triple digits. He is a skilled assassin which uses a number of blades and hatchets as apart of his arsenal. 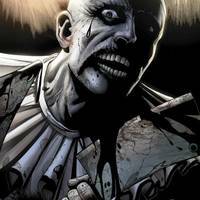 Pagliacci is a monstrous psychopath who seems to live to kill, wanting to rake in the highest possible body count. Every part of Pagliacci is strange and creepy, even down to the way he moves, moving like weird, super-acrobatic mime with a very odd body language. His personality is even stranger, acting as if he were some sort of great opera singer, ranting about his “art” and disliking it when there is noise distracting him away from his “performance” of mass murder. He will occasionally deliver lines from some tragic play in a sarcastic tone, to mock the suffering and death around him, in a sinister comedic way. Pagliacci is completely dissociated from the world and likes to treat it as some kind of surreal Grand Guignol. We are looking for a voice similar to either Tyrian from RWBY or the voice is open to interpretation. - Pagliacci: "The very sweetest cherries in that crate, I promise you. Young and tasty. Delivery by Friday, courtesy of Pagliacci." - Pagliacci: "It’s the 21st century. It’s all about branding the merchandise, isn’t it? We’ll make a good time. The crew is under our command. We won’t have any trouble."